This is an online tool which could be used to practice listening/dictation skills by listening to an audio and writing the words that they hear in a box provided. The users listen to the parts of the sentence and at the same time, they need to type the words that they listen to a text field. The word will only appear if the spell the correct one. They are able to listen again to the sentence and can get some help by setting the activity to auto complete the words as they type them in. There are also other languages for dictation apart from English; Korean, Hebrew, Chinese, Finnish and Tamil. This website could be used for the students to improve their oral comprehension as well as spelling skill. # Once you are directed to the page, Then You can choose the story that you prefer to listen to.The story are based on different level of difficulties. There are 25 (2 to 26) levels provided. # After that, you can choose any mode that you like. There are three options available; full mode, quick mode and blank mode. #Next, click the play button to listen and at the same time, you can try to write words in the box provided. If you unable to spell the word, you can click the hint button. A red 'good' will appear at the end of line if you write correct sentence. You can also submit your own oral recording as part of the bank of recorded items. # In order to save your score, share and save audios and collaborate with other to dictate and do audio recording, you need to sign in and establish an account. Teacher can do differentiation in the classroom based on students level. For weaker students (who has low language competency), the teacher can assign the listening story from low level, which is below level 5. Thus, by doing this, all students have the chance to try out the activity. In addition, this could be a motivation for low level learners since they still can do the same activity even though they are from different level as compared to advanced students. Teacher can also make it as a game where students can compare their score with other students. In this activity, at least two students need to choose the same listening title/text. Then, individually, they would need to do the activity and finally compare their score with those who do the same listening title/text as them. To encourage students to engage in communication, the teacher may asks the students to discuss about how they could improve their scores and what are the interesting issue which occur regarding the listening text. This activity would make the students interested to speak and discuss with their friends. If it is done outside the classroom (for autonomous learning), teacher can make it as a homework and gradually check the students' score. The teacher can give comments and feedback whenever necessary. Ask students to find any article of their interest. Record it and exchange it with their friends to transcribe. This is a kind of personalisation since the students can choose anything to record. Students can use this tool at home whenever they feel that they want to do some practice. Students can develop their vocabulary on their own autonomously. 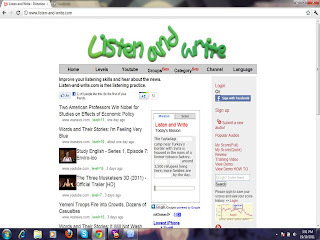 'Listen and Write' tool could be an interactive way for the students in learning. Good system for evaluation and students can keep tract on their own progress. This is because, when the students sign up, they can review their scores. It is a free listening practice! Students can choose to listen to any topics that they like since there are 7 categories available (Learning, news, music, kids, movies, TED and words stories). Students can choose three different modes based on their preference; full mode, quick mode and blank mode. Students can choose the level of difficulty based on their language ability. There are levels 2 to 26 available. So, students can work based on their own pace. Students can also download their own audio that they want to transcribe. There are possibilities for learning other languages apart from English since the audio available in other languages as well ( example: Chinese, Korean and Finnish). It is unsure whether the sources are reliable or not since it is based on Radio station in America. 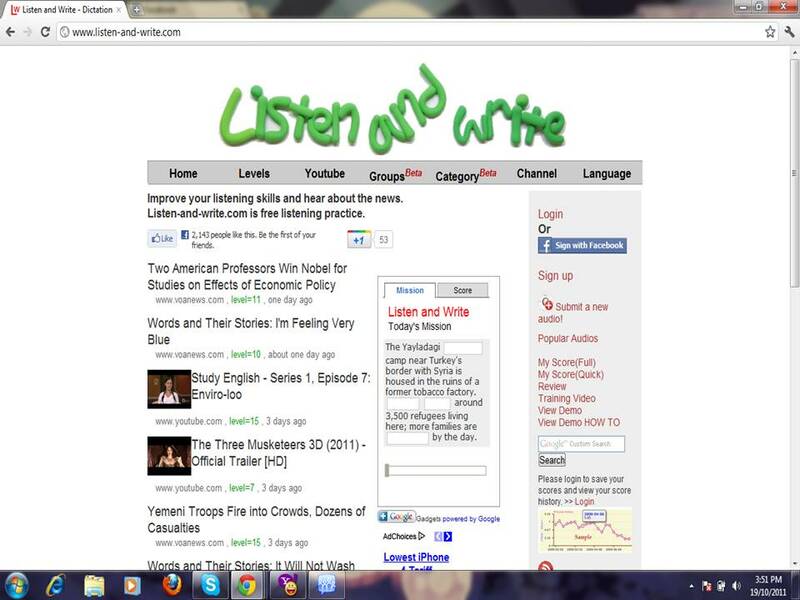 The webpage for 'Listen and Write' has a Facebook and Twitter link. Thus, this could be a distraction while they are doing the activities. As this tool is usually for autonomous learning,if the students use it outside the classroom, therefore, the teacher might not get the feedback about how the students progress in using this website. Not suitable for visual types of learning students since it is more on listening and writing. This tool does not allow the users to save their transcription and export them to a word processing program. Some students might not be interested to listen to the topic listed as they are not really familiar with those topics. The speaker in the audio uses American language, speak with quite fast speed and sometimes some of them have slang. It would be difficult for some students to understand the audio.